Last week Colleen McCrory, Deputy Leader of the Green Party of British Columbia (BC), attended a session of the State Parliament of Lower Saxony on May 26th in Hanover, Germany. One of 16 states in Germany, Lower Saxony is the second largest in terms of area, after Bavaria. With a population of almost 8 million, it is 9.6% of the total population of Germany. McCrory was invited to attend the 34th session of electorial period of the Parliament by Stefan Wenzel, Green Party Member of Parliament and Parliamentary Speaker for the Green Party of Lower Saxony. "It was amazing to discover that 14 Greens are Members of Parliament and to see the unified force of their representation in the parliamentary session," said McCrory. She noted "the Greens are given proportional representation even though the Green Party represents only 7% of the vote in the State of Lower Saxony." Following Parliament, McCrory visited the headquarters of the Green Party of Lower Saxony in Hanover, where she was given a tour and an introduction to the history of the German Green Party. It was established in 1979 largely as a result of the popular movement to ban nuclear energy. Prominent founding members of the Green Party currently in the Federal Parliament include Joschka Fischer, the Foreign Minister and Juergen Trittin, the Environment Minister. In Hanover McCrory also met Green Party MP Rebecca Harms, the German Green Party candidate for the European Union in the upcoming elections on June 13th. Harms was one of the most outspoken opponents of the transport of nuclear fuels during the Gorleben demonstrations in the early 1980s. 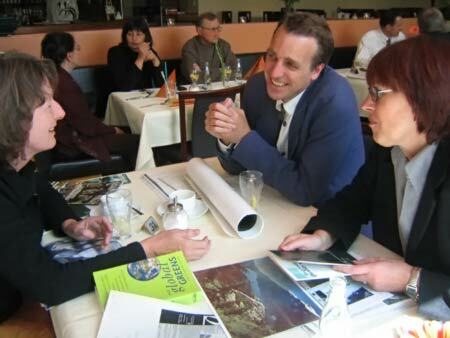 In the afternoon, McCrory was invited to lunch with Stefan Wenzel and his fellow Green MP, Georgia Langhans, who is also Secretary of the State Parliament of Lower Saxony. They were surprised to learn that BC exports raw logs out of the Province, that BC has no provincial Endangered Species Act and that forestry legislation in BC is practically non-existant. With no Green representation, both Mr. Wenzel and Ms. Langhans could understand how the present BC government is able to legislate so many anti-environmental policies, while collaborating with industry for short term economic gains. McCrory was impressed by the serious global responsibilty assumed by the German Greens for cleaning up and protecting the environment. It was clear to her that the Green MPs are committed to making long term changes for the future. From June 1 - 4, for example, Minister Trittin opened the renewables2004 International Conference in Bonn, which was hosted by Germany. Thousands of delegates from all over the world attended the meeting to explore alternatives to the nuclear and oil and gas industries. According to Minister Trittin, the job market created by renewables is the largest and most vigourous in Germany. McCrory told her German colleagues that she wished BC was also moving in this direction, instead of planning more dams and further oil and gas development. 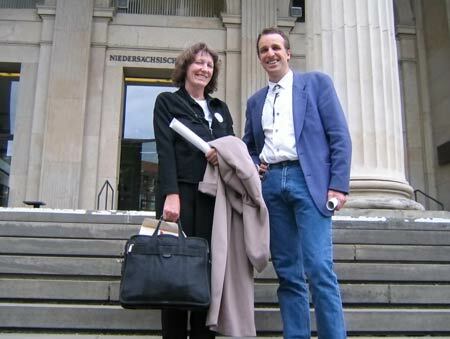 Colleen McCrory and Stefan Wenzel in front of the Lower Saxony Parliament building. Colleen McCrory, Stefan Wenzel and Georgia Langhans. 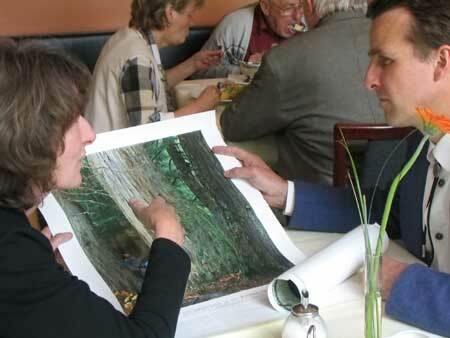 Colleen McCrory shows Stefan Wenzel a poster of ancient BC temperate rainforest trees.